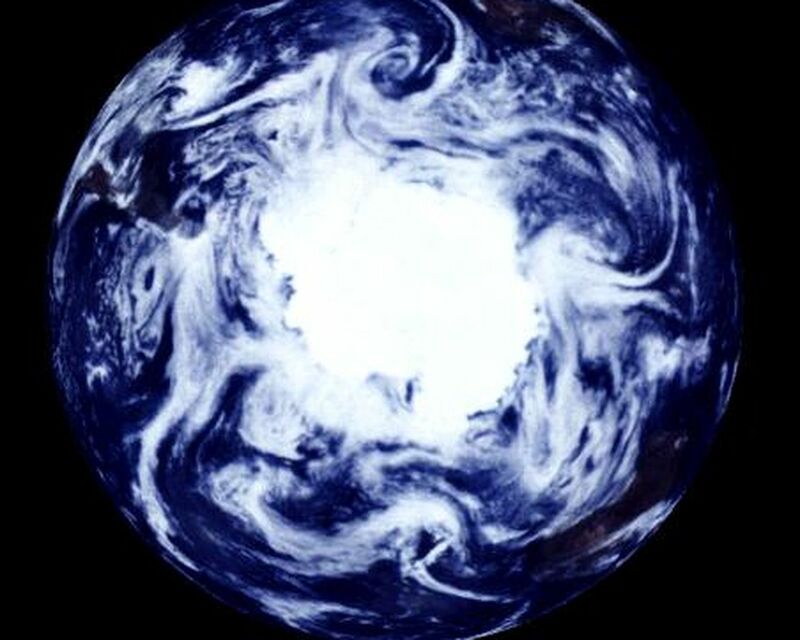 This view of the Earth shows a wonderfully unique but physically impossible view of the southern hemisphere and Antarctica. While a spacecraft could find itself directly over the Earth's pole, roughly half of the image should be in darkness! This view was created by mosaicing together several images taken by Galileo over a 24 hour period and projecting them as they would be seen from above the pole. The continents of South America, Africa, and Australia are respectively seen at the middle left, upper right, and lower right. 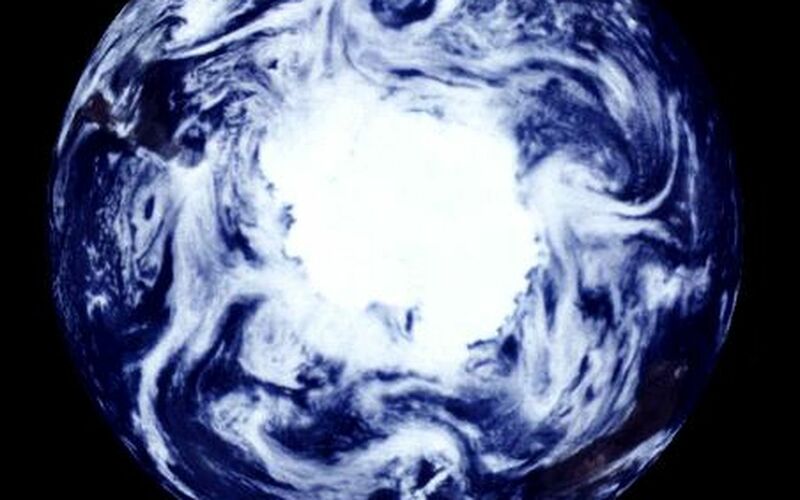 The slightly bluish ice and snow of Antarctica include large ice shelves (upper left, lower middle), a broad fan of broken offshore pack ice (lower left and middle) and continental glaciers protruding into the sea (lower right). The regularly spaced weather systems are prominent. 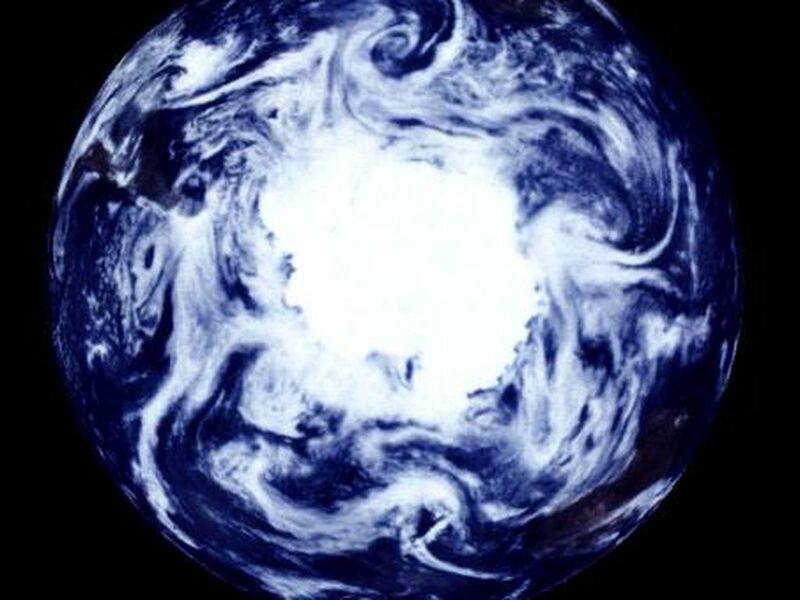 Most spacecraft traveling near the Earth's poles are in very low Earth orbit, and cannot acquire panoramic shots like this one. Galileo's view of the southern hemisphere, combined with the spacecraft's special spectral properties (four separate narrowband filters that measure the brightness of reflected light at specific infrared wavelengths), led to a number of unique observations. For example, Galileo's cameras distinguished between ice and high stratospheric clouds, allowing scientists to study the correlation between these clouds and growth of the ozone hole. 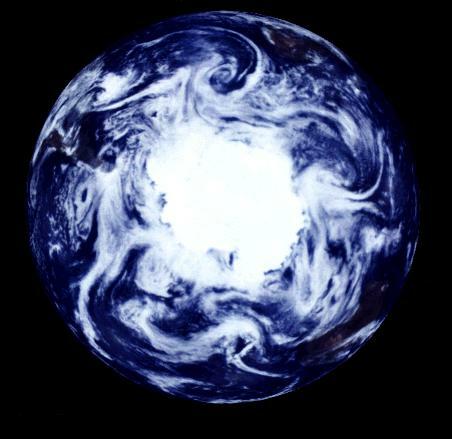 This image and other images and data received from Galileo are posted on the World Wide Web. The Galileo mission home page at URL http://galileo.jpl.nasa.gov.